This is very important... An inventory of issues you are having with the CF script and or mobile app would be very useful at this particular time. So please add any problems you are having here, there is a very good possibility at this particular time that they may be addressed as they should be. So please chime in with your observations ASAP. I will start with the very inaccurate and almost nonfunctional search feature issue that has plagued us for a long time here. I think my initial fervor was a tad hyperbolic... my apologies. Also, do not take the tone in this personally-- I'm not wordsmithing this as if I was presenting to a client, so it's more stream-of-consciousness/off-the-cuff. It's more musing in most cases than accusatory. The continuous content scoll (as you reach the end of a thread, a RELATED thread starts to populate. I was a bit miffed by this in mobile, but it's definitely irritating on desktop view. I use Home and End to get to the top or bottom of a given page, but with the apparent elimination of pagination that seems like something I'll just need to change in my own habits. Also, when is the header sticky and when isn't it? it seems to scroll with you to a point and then disappear. I want the User Control Panel to appear in that top header (if you're logged in), but if testing shows it's better to exist in just in the member menu, that's fine. I nav to the User Control Panel more than anything to check posts, etc. Also with the "New Posts" nav link in the header maybe there's an excuse there? Is there benefit in having a generic "Gallery" link where it just shows the most recent uploads? Maybe include a link in that header/nav area (once logged in) or in the user menu to go directly to the Underground -- quicker access, fewer clicks. The Highlight Banner (with jeeps and owners names) is now pretty obscured with the new upper header/banner area overlay. Anyhow, those are the more immediate things I've noticed. Take them with a grain of salt from a salty UX designer thanks for keeping this updated and clear of bots. Most forums we be lucky to have as much. Last edited by jessenator; 08-03-2018 at 08:50 PM. "It was fine for the last week or so when it was revamped as the only difference i could see was the coloring and a couple icons for Twitter, etc. I didnt mind it. But today, the blue "Reply" icon that used to show up at the bottom of the last thread was gone. It was easy to spot as it was. Now its only at the top, so one has to scroll back to the top of the page. Didnt seem like it was thought thru very well. Then i noticed the little toolbar at the bottom with "Quick Replay" and "Reply", which i didnt even see right away. Then i noticed there are two "Quick Reply" at the bottom. One comes up with its own message box as usual, at the bottom of the thread, and the 2nd in the little toolbar at the bottom of the page. Do we really need two in the same place? Is the "Jump to Forum" at the bottom really needed? It doesnt seem to make navigation any faster. Are the forums becoming a compromise between desktop users and mobile? For what its worth, when Autoguide started buying all the forums they could (i pray CF never becomes one of them), they started doing the same thing and the forums were overloaded with doubles, and even triples of the exact same link, all on the same page, and in the same place, making most of them redundant. It doesnt look streamlined at all. When the page has been scrolled such that the "Jeep Cherokee Forum > CF Announcments & Suggestions > CF Suggestions & Questions" links appear maybe 1-2" from the top of the page, A 2nd set appears just above them in a little box, so you have two identical links for each right over top of the others. Pointless. Heres the strange thing about that. Sometimes this doesnt happen and the 2nd set of identical links doesnt show up. I dont mind change, but sometimes things are better left as they were, or thought thru a bit more. Another issue that bugs me is when you want to post pictures. They automatically end up in the User CP. I couldnt find a way to stop this. Is there one? Unless im missing something, it appears to be creating an album when i dont even have it set up for it. Also, when posting multiple links to pictures via copy and paste, some images dont show up. 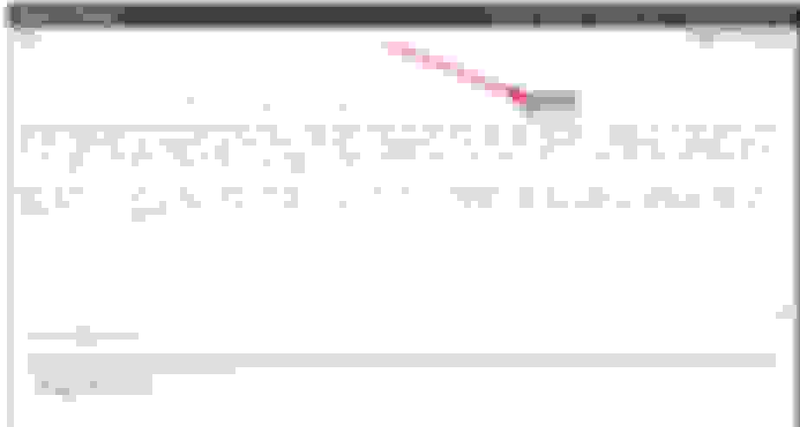 They show up as a link with the usual [img] [/img], but no picture. The rest post no problem." But i can edit this one. Another bug, it seems. Cant edit the first post you make in a thread, but if you post a second time, you can edit the second one. The first is still a no-go. Just like the thread i started in that link i posted in the previous post. So it is repeatable. Last edited by fb97xj1; 08-03-2018 at 11:45 AM. jessenator I saw your notes in the Underground. Please let me know which threads are jumping around on mobile. We are aware of the issues with the related thread loading when viewing the last post in a thread and will work to make that experience better. I am not aware of the links jumping you to an incorrect page and will need to look at that. Provide any info you have on which link and where it takes you, etc. fb97xj1 We are looking into why your post cannot be edited or quoted. I believe you are copying from Word or another source and that program's quotation marks are breaking something. To restore the site design back to the older format go to User Options here and disabled the option under "Infinite Scroll"
Thank you for dropping in to address these issues IB Nolan! Apparently there are some serious issues with the mobile app and view also. Last edited by Bugout4x4; 08-03-2018 at 01:42 PM. Thank you Jessenator for taking the time to catch this very important and probably limited window of opportunity! Now this one did work as it should. This is just a request... Nothing wrong with the function at all. But would it be possible to lengthen the image file upload time out? Some of us are reduced to a slower speed when our high speed allotment is out, and then we are not able to upload anymore because of the upload timeout setting. 50%-75% more would be great and cure this if it is possible? Last edited by Bugout4x4; 08-03-2018 at 03:34 PM. 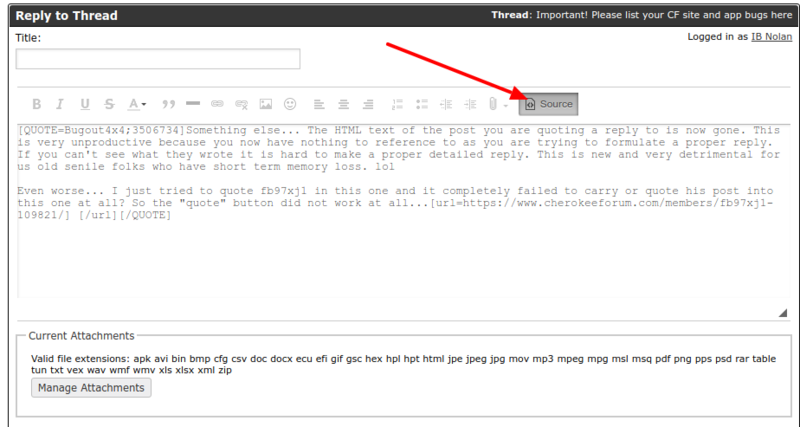 Try using the Source button to see the actual bbcode for any post you are editing (see below). I am looking at why the quote and edit function is broken on fb97xj1 's post. We are aware of the time out issues with slower connection and are working on a fix. It appears to be sporadic and occasional. Been testing around and now I can't replicate it. But it will probably pop up again. I will try to note the circumstances if it does. But it should pop up without having to hit a source button. These users here are not developers and keeping it simple and easy to use is very very important. Thank you very much for considering the upload time out issue. Is that in the progress bar package? Or is there a value setting in the plugin that directly addresses this setting? Very much appreciate you taking the time to look at that. It does function flawlessly with the exception of that upload time issue. Really, really appreciate your time and efforts to help with these issues. I just ran out of high speed on my connection. Would it help if I made an upload operation for you to track? I am here to help all I can if you can use it. I am pretty good at clicking and observing... Seriously... please let me know if you need me to perform something to track if it will help. Short but very important... As a big rig shop owner who works on computerized truck systems all day long, and give consultation diagnosis by phone on these all day long to other shops, I can testify that I would not be able to be as good as I am at what I do if I did not request and get input from the driver and actually listen to it.